My article today is going to be a little on the lite side. Mea culpa, but let me explain. Once a year I teach a graduate course at the University of Denver on the history of transportation development and regulation in the United States. My wife refers to this this as my annual “teachapalooza.” What I do is deliver a 7 hour lecture on transportation development in the United States. This means I cover about 38 years and hour. Even though I have done this for five years now, the task is still daunting and preparation consumes a large amount of my time for a week or so prior to the course. This year’s teachapalooza was last Wednesday, and I flew back to Washington D.C. last Thursday. This would normally have provided me with ample time to pull together an article for Tuesday except for one little fact -- my wife and I were scheduled to leave Saturday for a family reunion in Nags Head North Carolina. And our beach cottage there has (believe it or not) no internet. Everything, therefore, came down to Friday. And what you, faithful (I hope) readers have is a shorter entry this time around. So, what I thought I would do, within the constraints outlined above, is tell a funny back story about writing pastiches and, specifically, about writing my recent Ellery Queen story, Literally Dead, which appears in the December edition of Ellery Queen Mystery Magazine. One of the hurdles involved in writing a pastiche -- at least a pastiche concerning a character, such as Ellery, who is still in copyright -- is that each story I write has to be cleared prior to publication by the heirs of Frederic Dannay and Manfred B. Lee. Luckily for me submitting stories to the Dannay and Lee families is far from a burden -- they have always been accommodating and, more to the point, it has been great fun to get to know, and to exchange emails with, the likes of Richard Dannay and Rand Lee. This is something that, as an Ellery Queen fan for decades, makes my day. But back to today's story. As I have said on many occasions, I abhor spoilers. Nevertheless I’m going to tell you just a bit about what transpires in Literally Dead since the story that follows only makes sense if you have been forearmed. 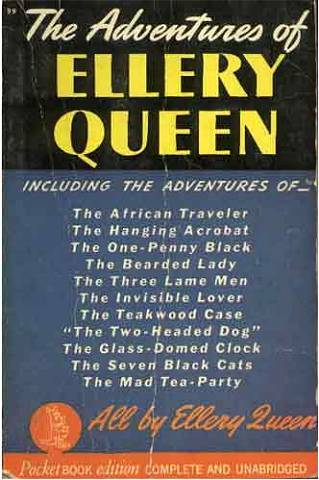 To begin with, it hardy tells too much to point out that in every Ellery Queen story someone inevitably must bite the dust. No exception with mine. While that crucial (and lamented) central character takes a few pages in my story to be done in, if you have any background at all in reading “fair play” mysteries you will have seen it coming from the very beginning. The story introduces a famous author, Jennifer Kaye Rothkopf, who has just completed the seventh, and (to the dismay of many) final, volume of a fantasy series that tells the story of a young man who has been educated in a famous sorcery school. As I said, you can easily guess what is going to happen to poor Jennifer. Okay. Even as someone who is sort of known for his supposed in-depth knowledge of the works of Queen I was completely stumped. I had only the vaguest memory of the story to which Richard referred. I immediately went to my Ellery Queen library and found the story, one of the entries in The Adventures of Ellery Queen, published way back in 1934. My copy of the short story anthology was no spring chicken itself -- the volume still had the receipt in it. I had purchased it for ten cents at a used book fair in St. Louis in 1961, when I was all of 12 years old. I remembered reading the stories at the time, but not since. No wonder it had faded from memory. Suffice it to say this story, sadly, was not Ellery at his best. It also featured more gore than the reader of a golden age mystery usually anticipates, including the serial demise of those cats. But I persevered, all the way to the last page. And right up until the bottom of that page I had absolutely no idea what Richard was talking about. And then all became clear. [Correction Note: The original version of this article referred to the works of Ellery Queen as being "in the public domain." The obvious error in that statement is that it should have said "Ellery Queen is NOT in the public domain." Oops, and sorry about that! Richard Dannay, in an email, called my attention to this error. The Queen works are not in the public domain and are, in fact, as Richard points out, protected under copyright laws. The article has been changed to reflect that fact. Also deleted from this version is a reference to Conan Doyle's Sherlock Holmes works as being in the public domain. That reference has been omitted in light of the continuing (and very interesting) litigation relating to the literary protections that currently are to be accorded to the Sherlock Holmes stories.